The McEliece public-key cryptosystem is based on the fact that decoding unknown linear binary codes is an NP-complete problem. 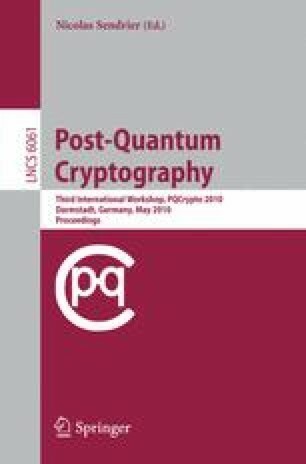 The interest on implementing post-quantum cryptographic algorithms, e.g. McEliece, on microprocessor-based platforms has been extremely raised due to the increasing storage space of these platforms. Therefore, their vulnerability and robustness against physical attacks, e.g., state-of-the-art power analysis attacks, must be investigated. In this work, we address mainly two power analysis attacks on various implementations of McEliece on an 8-bit AVR microprocessor. To the best of our knowledge, this is the first time that such side-channel attacks are practically evaluated.